Two references in the Vestry Minutes of St Mary's Church, for 6 May and 26 December 1700 record the presence, in Twickenham of Sir Abstrupus Danby, sharing a pew with a Mrs Berkley (sic). Danby (described as a "wool baron") came from North Yorkshire where, on the death of his father in 1695, he had built himself a house at Swinton having sold his estate, Scruton Hall, which the family had owned since about 1575. He was knighted at Kensington, presumably by his monarch, in April or August 1691. He was a JP and a Deputy Lieutenant of the county. The family were longstanding in Yorkshire from before the Conquest and enjoyed many connections in the county. His grandfather, Sir Thomas, a Royalist had been High Sheriff and three generations before this another Thomas had married Elizabeth Wentworth sister of Thomas Wentworth Earl of Strafford who was executed in 1641. His Christian name is curious and has been stated to have derived from a confused christening by a befuddled parson. This hardly explains just what name was really intended, though it was probably intended to be Antrobus, after that of his father. In any event he named his own son Abstrupus, later. 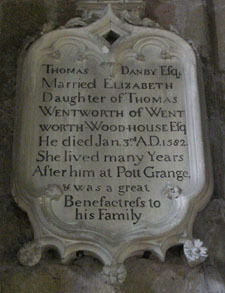 There is a memorial to both him and his son, among various Danby memorial stones in Masham parish church. Danby died in 1727. In 1720 Abstrupus the second, described as Lord of Mashamshire married Battina Eusden (another curious Christian name), both for the second time (see below). She was a sister of Lawrence (1688-1730), Poet Laureate from 1718. Pope knew Eusden and described him as "a drunken sot of a Parson" in a letter to John Gay dated 23 October 1730. He had in fact died on 23 September. There are both specific and tangential references to Eusden, apparently a man of little talent and addicted to alcohol, in The Dunciad. Eusden was succeeded as Poet Laureate by Colley Cibber, to Pope's chagrin, but that is another story. His connection with TwickenhamIt is not known what brought Danby to Twickenham but it was probably his connection by marriage with the Berkeley family, owners of Twickenham Park from 1668 until 1685 starting with Lord John Berkeley of Stratton. His sister, Jane Davies lived elsewhere in Twickenham from 1679, on the estate which later became Orleans House, dying in 1694. The property was held on a Crown lease and in 1697 Jane Davies's executrix, described in the Indenture of Assignment as the Honourable Jane Berkeley of the Parish of St Clement Danes transferred the property to John, Lord Poulet (Indenture 467 held in Richmond upon Thames Local Studies Library). It seems likely that Jane was the Mrs Berkley noted in the Vestry minutes and that she was an unmarried niece, the daughter of one of John Berkeley's other brothers. (131). Lawrence Euesden, Rector of Spofford, Dr. of Devinity, was bur. the 14 of February, 1699. Lawrence Eusden, clerk, M.A., was instituted to the rectory of Spofforth, 19 Jan. 1677-8, from the registers of which parish, and other sources, I glean the following particulars relating to his children: Catherine, bap. 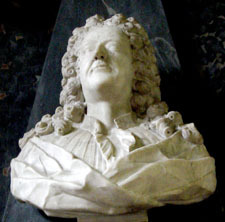 21 Feb. 1683-4, bur. 1 March, 1694-5. Rosamond, bap. 19 May, 1685, bur. 16 Aug. 1686. Battina, bap. 28 May, 1686, married at York Minster, 14 Jan. 1719-20, Abstrupus Danby,*17 esq., of Swinton, lord of Mashamshire, by whom she had issue three daughters, Judith, Anne, and Battina. Mrs. Danby*18 died intestate in 1748, and was buried at Bath. Lawrence, bap. 6 Sept. 1688, was chaplain to the learned antiquary, Richard, Lord Willoughby de Broke, and rector of Coningsby, co. Lincoln. He was also Poet Laureate from 1718 to 1730, during which time he made, but never published, a translation of the "Jerusalem Delivered " of Tasso. John, bap. 24 Oct. 1690, bur. 3 Dec. seq. Frances, bap. 26 April, 1694, died unmarried and intestate at York, administration of her effects being granted 20 May, 1755, to Ann Danby, spinster, her niece and next of kin. " Madam Catharine Eusden, wife to ye Reverend Doctor Eusden, Rector of Spofforth," was buried there 15 April, 1699; and, at the same place, on 16 Oct. 1683, "Joseph Daniel of Acaster, and Battinah Eusdin, of Spofforth, was married with a license." The bride was probably the rector's sister. Her husband, Joseph Daniel, esq., of Acaster Malbis, near York, had lost his first wife, Sarah, daughter of Conyers Rulerbut, on 17 Nov. 1681. *17: 14 Jan. 1719-20. "Mr. Abstrupo Danby & Mrs. Batte : Eusden" (Reg. of Marriages in York Minster). She was his second wife. *18: 18 April, 1752. Administration of the goods of Battina Danby, late wife of Abstrupus Danby, esq., of Swinton, was granted to Wm. Danby, esq., and Ann Danby, spinster, daughter of the said deceased.